We first came across Mesushi after noticing that a friend had ‘liked’ their Facebook page, and thought it sounded like a great concept. Choose from a range of sushi boxes or platters on their website, and they’ll deliver then to you (on a Thursday or a Friday) free of charge. “The first time I ate sushi was about six years ago ,with help of my friend, who explained to me how to eat sushi and also to warn me off using too much wasabi, a mistake I’ve made many times!”, says Daniel. He started the company around a year ago, delivering sushi to hungry customers on Fridays and trading at some of Bristol’s markets. A few months ago, he made the decision to increase deliveries to include Thursdays, and the company has been going from strength to strength. 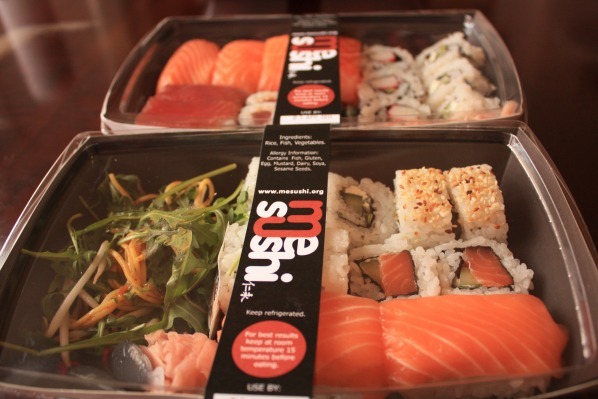 Orders can be placed via the MeSushi website, where you can choose from a variety of sushi boxes – or platters, if you’re ordering for a larger group. 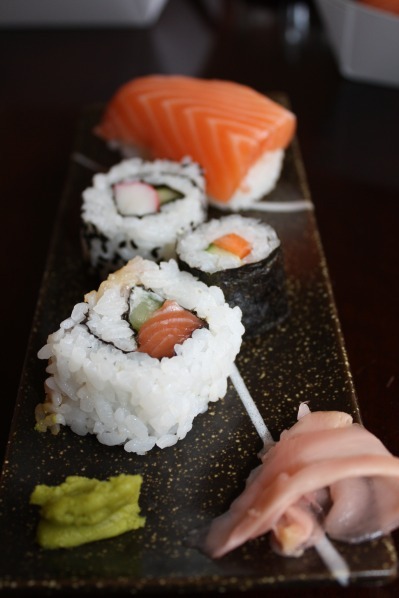 The most popular choices, says Daniel, are the salmon nigiri and the spicy tuna maki (ever customer-focused, he sends out feedback surveys after delivering orders) – and he recommends the tuna sashimi as a personal favourite. We were told that our delivery would be made between 12 and 1pm, and as we were out, we had it delivered to a neighbour to pick up when we returned. No problems here whatsoever, and we came back to a bag of assorted sushi, high quality disposable chopsticks and the requisite soy sauce and sachets of wasabi. Presentation of the sushi is very smart. The sushi was delivered in cardboard boxes with a sturdy, see-through plastic top, and a branded sticker that sealed the box shut. The box doesn’t seal once you’ve removed the label, though, so if you’re saving any for later (it’s recommended that you eat it all the same day…) then you’ll have to transfer it to another container. The sushi itself was beautiful, a few mis-rolled edges on the larger rolls but great apart from that. Two of the boxes came accompanied by a noodle, rocket and beansprout salad, which was lovely and fresh in flavour but made some of the sushi rolls a little soggy in places. The fish itself tasted beautifully fresh (Daniel won’t disclose his sources!!) and was beautifully sliced. While the selection may not be as varied as the supermarket sushi you may buy for lunch, there was still enough of a range to keep us happy – and, of course, everything is made on the same day as it is delivered. We particularly like the fact that there’s a decent range available for vegetarians, including cream cheese and cucumber iso rolls, carrot and cucumber maki, and cream cheese and chive nigiri. Prices are very reasonable, starting at £3.99 for a vegetarian box, going up to £36.99 for a 56-piece deluxe platter. With the added bonus of a free delivery service (selected postcodes only – see website for details), I’ll certainly be using MeSushi in the future for a healthy and different lunch option! Please note: this sushi was received free of charge, but in no way impacted on our opinion. We were not obliged to write a positive review, and MeSushi did not see this review before it was put up on the site. Thank you for your feedback! We have now adjusted our sushi boxes to include a separate pot for the salad dressing, this will stop the salad from tainting the sushi.